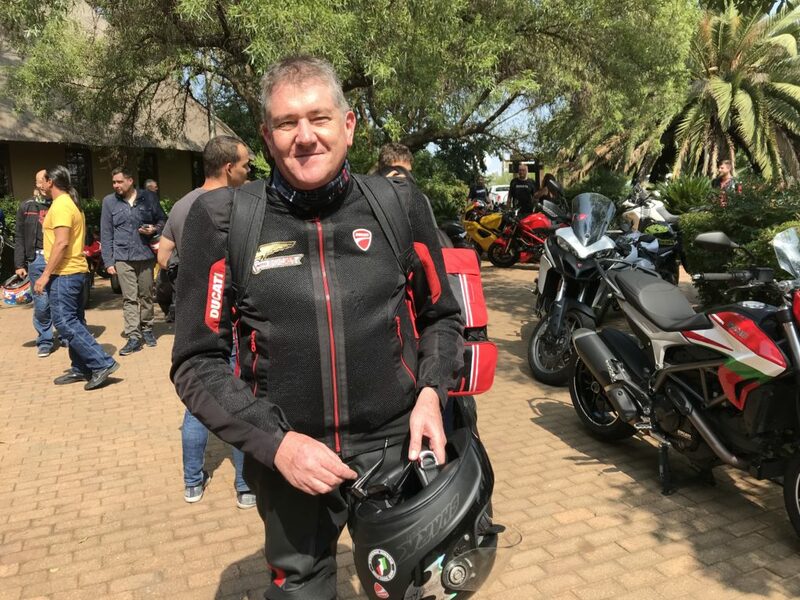 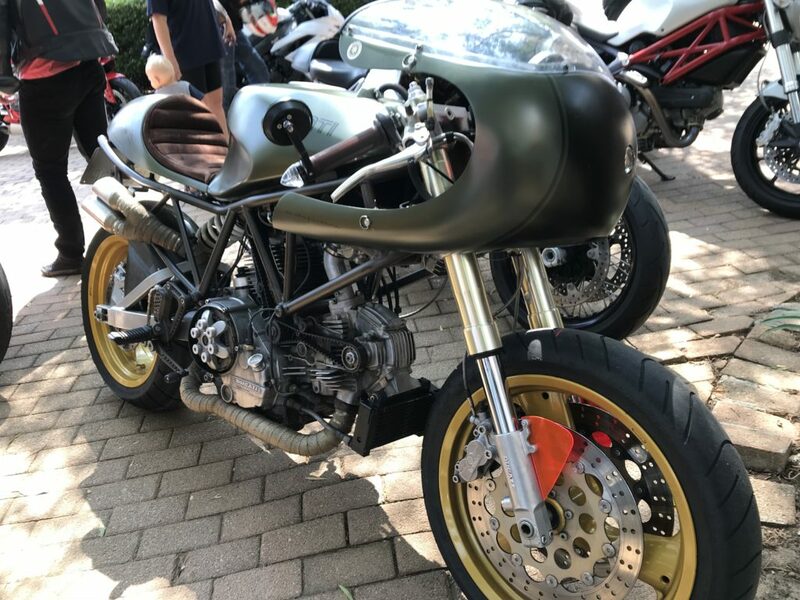 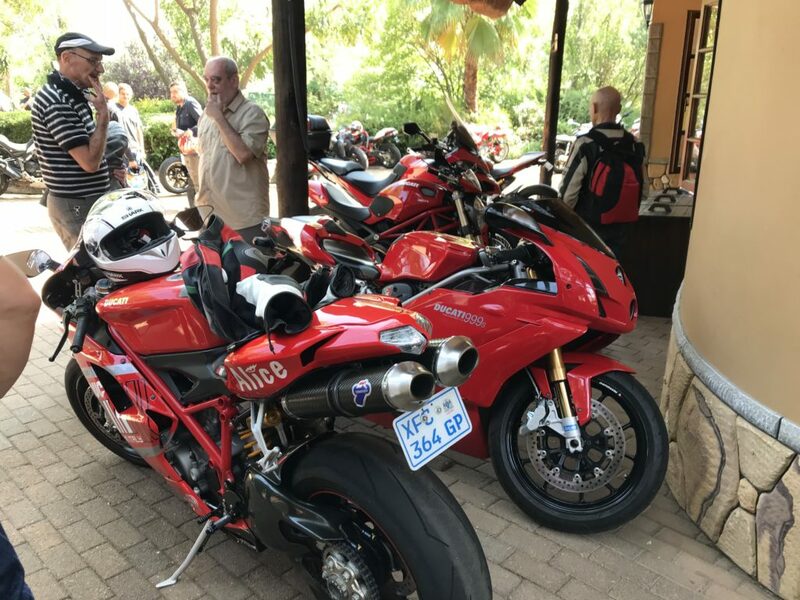 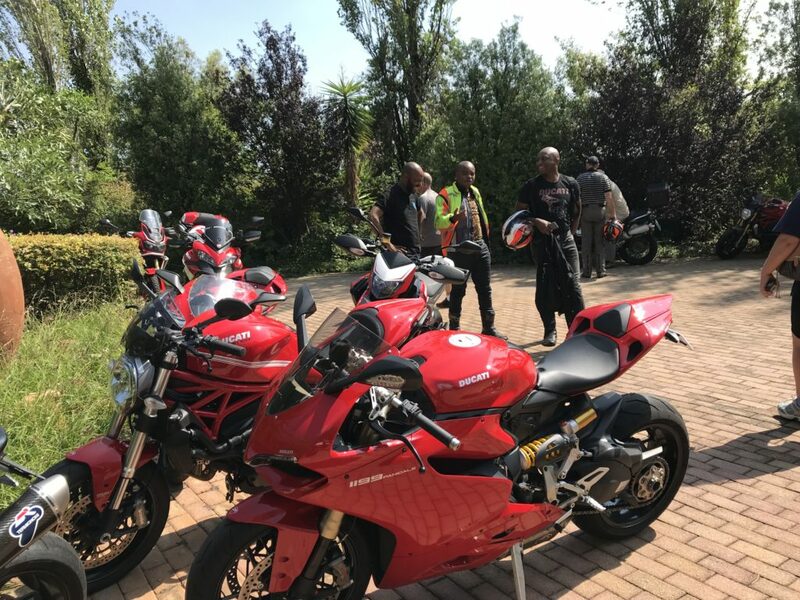 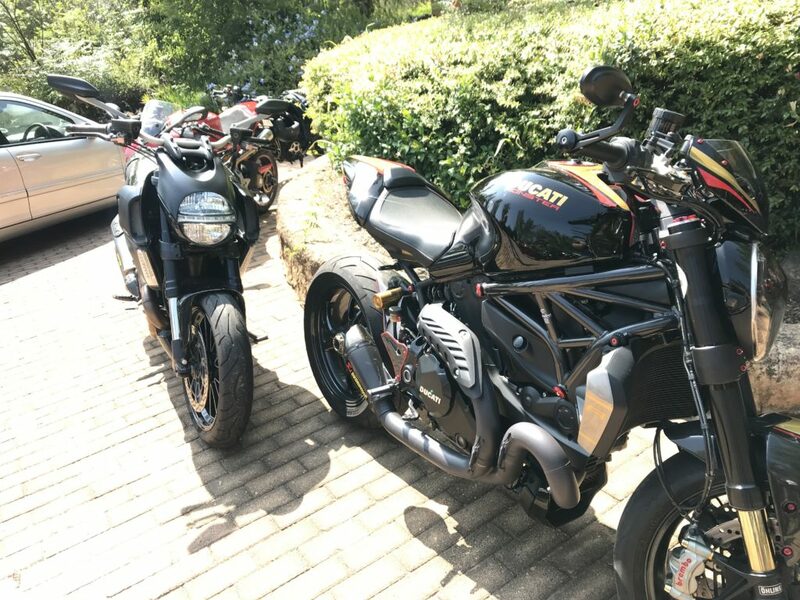 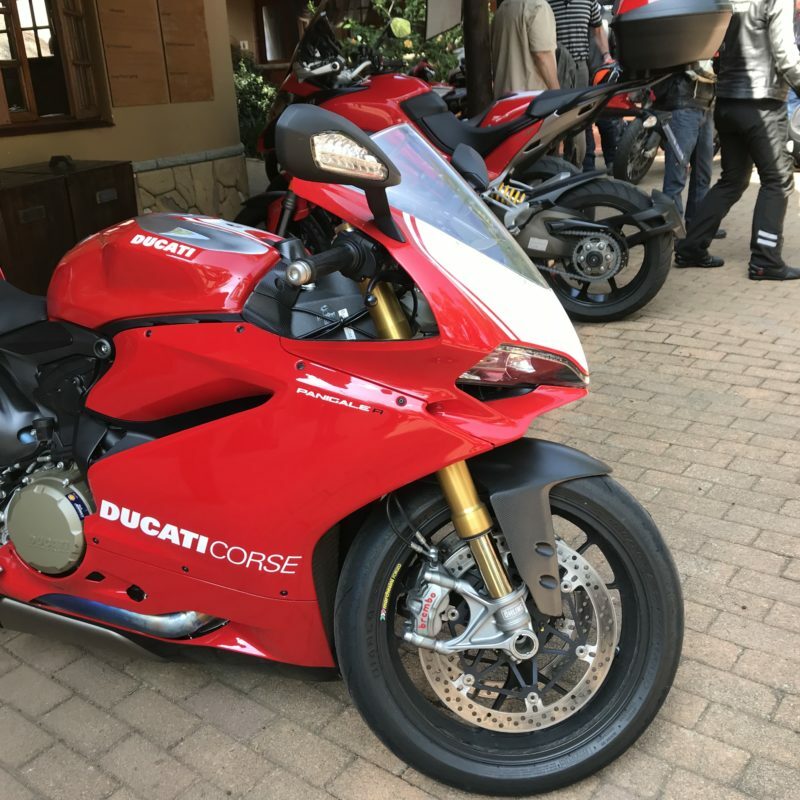 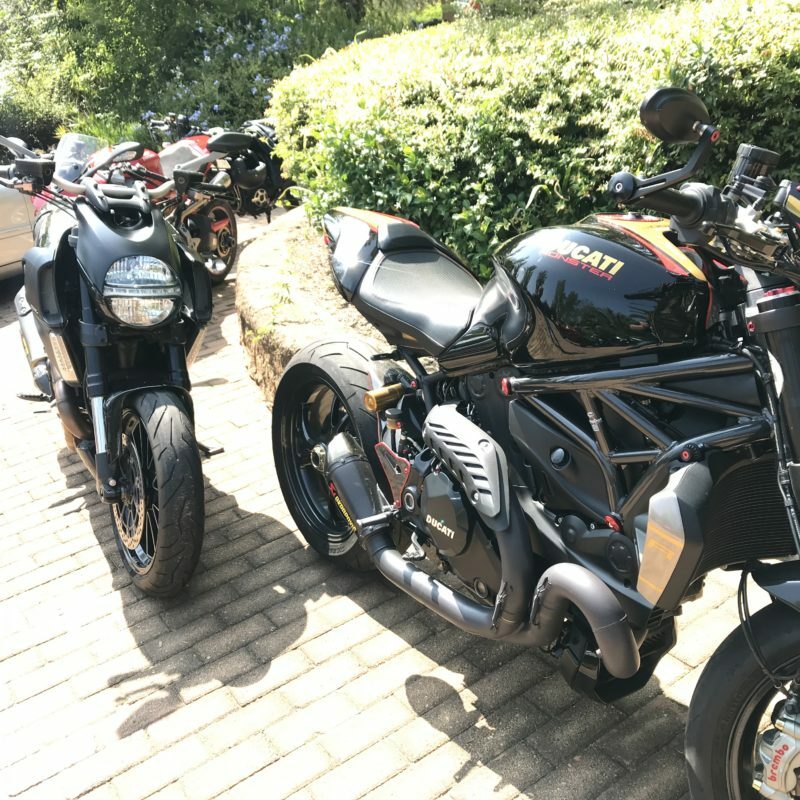 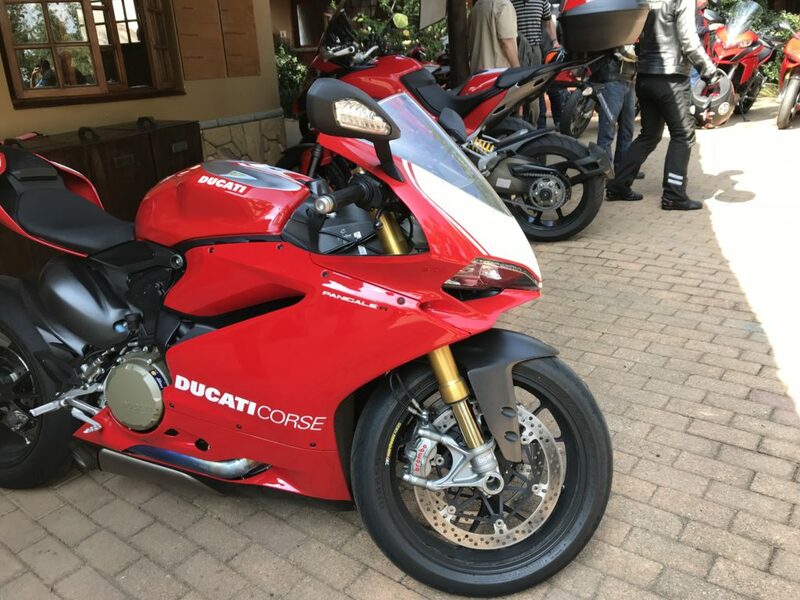 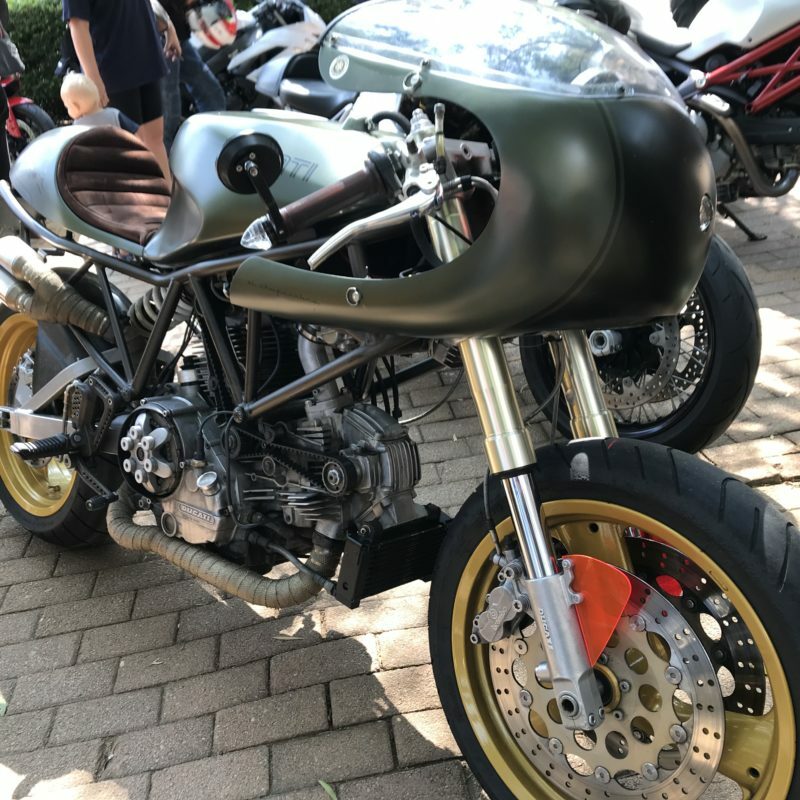 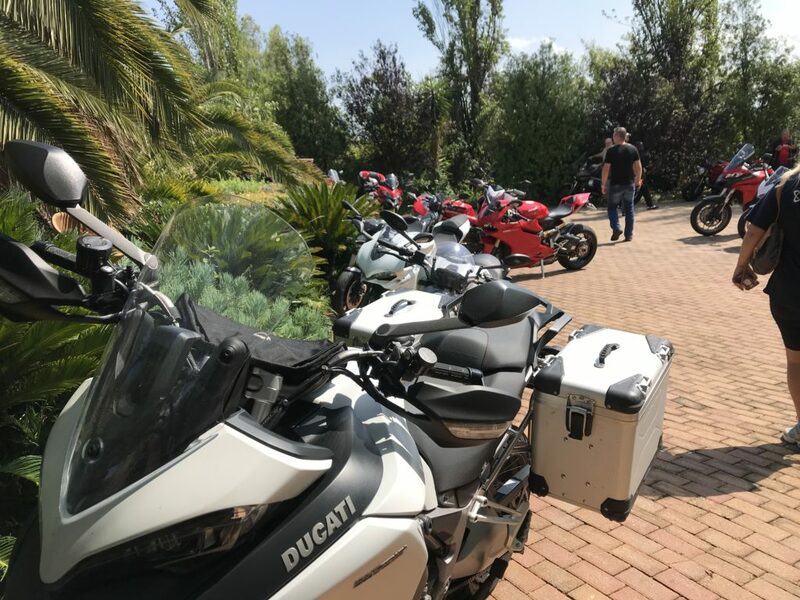 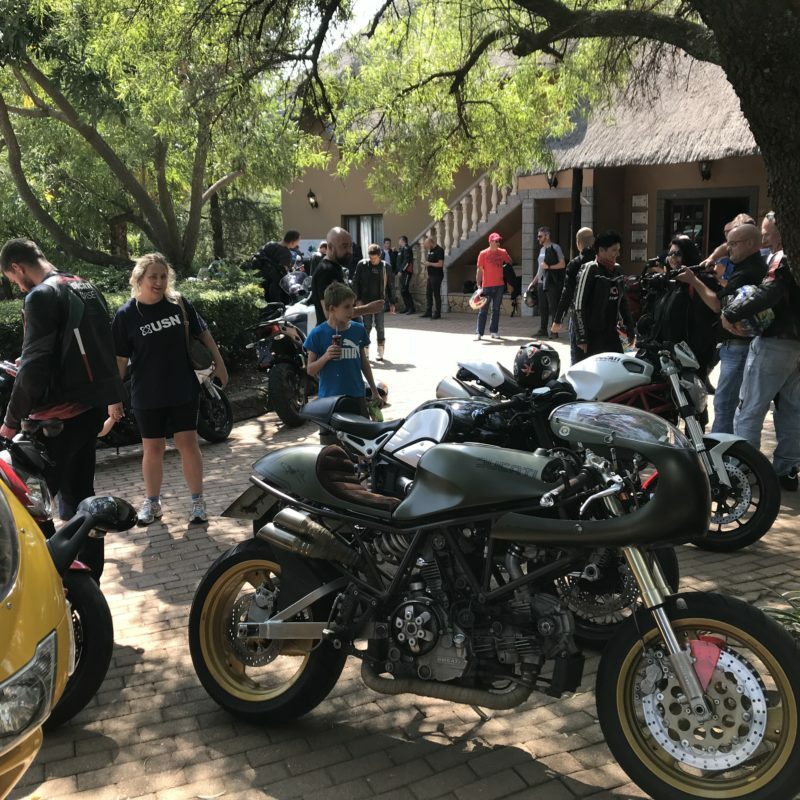 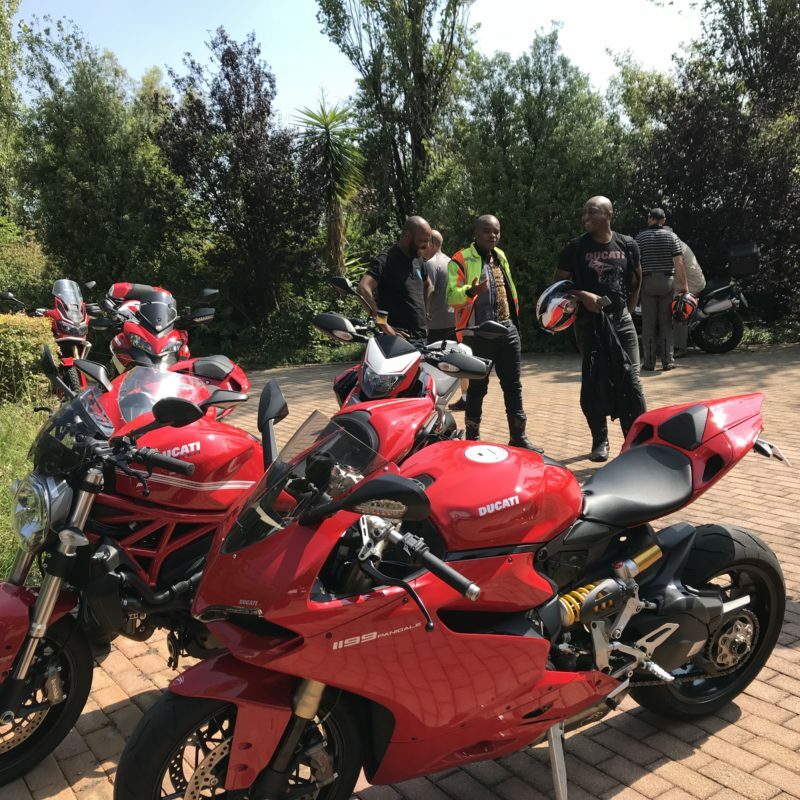 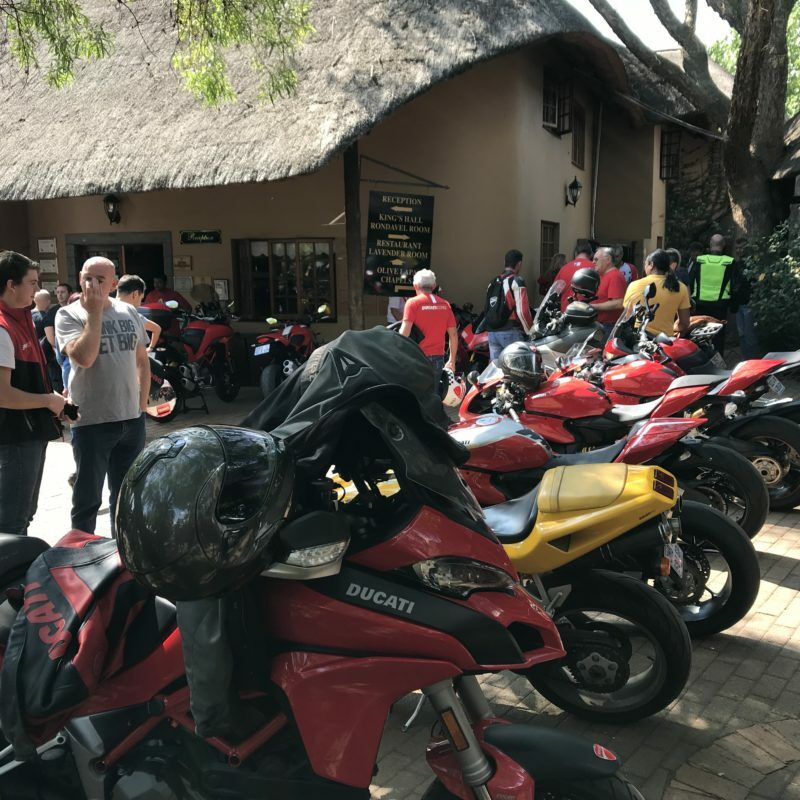 The Ducati Owners Club of South Africa hosted their second Ducati breakfast run, this time leaving Ducati Johannesburg and heading out, via the long route, to the Valverde Country Club near Muldersdrift. 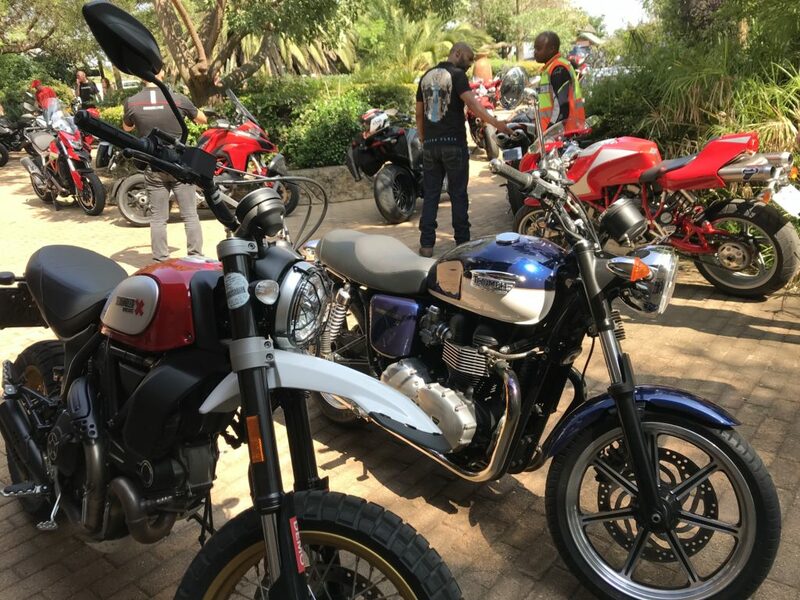 There were 60 bikes on the run, comprising the usual motley of different people, all interesting and all amazingly good fun. 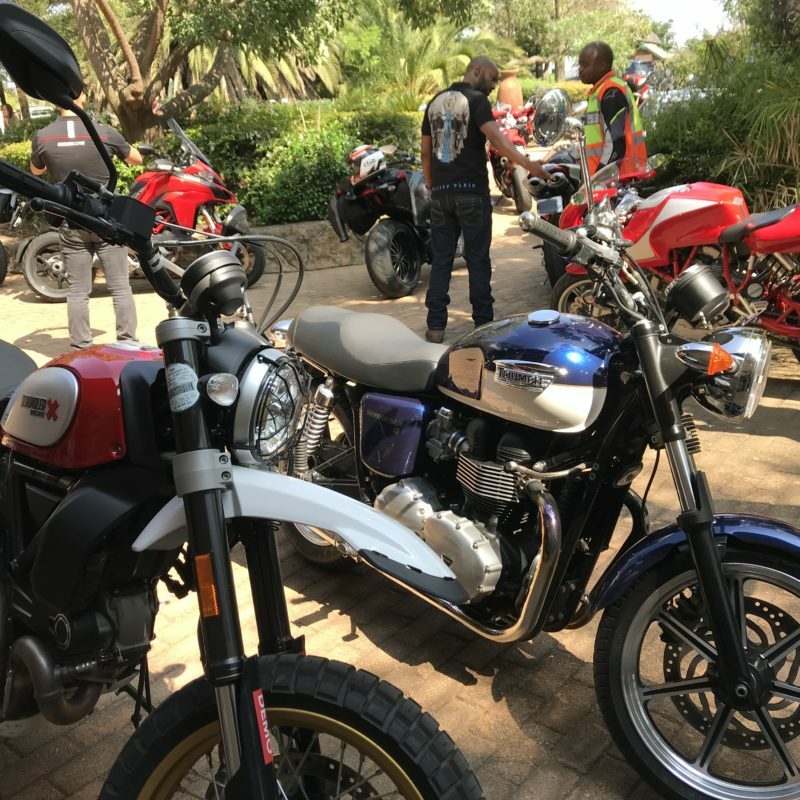 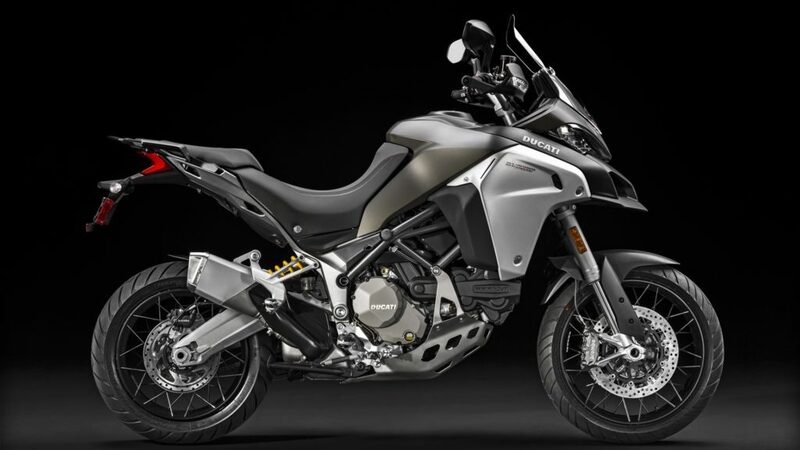 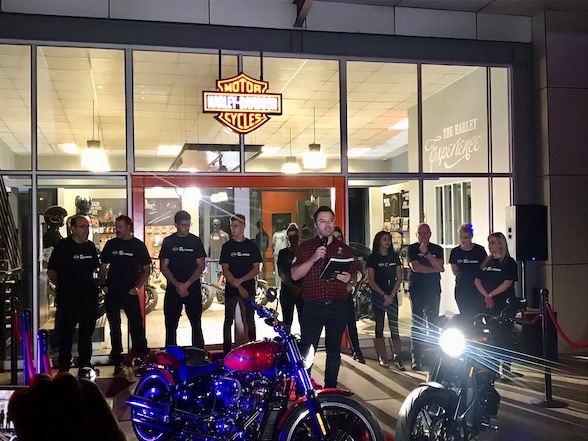 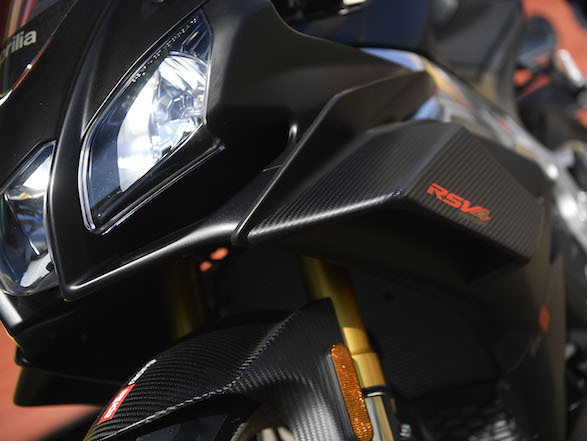 Riding up and down the kilometre-long line of motorcycles is entertainment in itself, looking at the various motorcycles ranging from 2018 models to bikes going back to the 80s and other bikes that have been modelled to look even older than that. 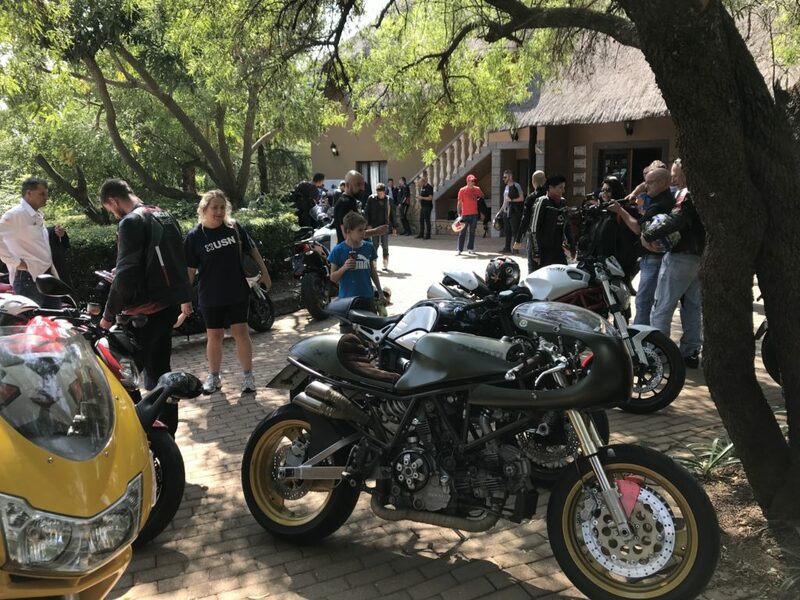 Valverde is both a popular and beautiful venue, and the serenity of whizzing bicycles was briefly interrupted with a boom-boom, a chunka-chunka and a clink-clink as the the group swarmed the tree-filled parking lot. 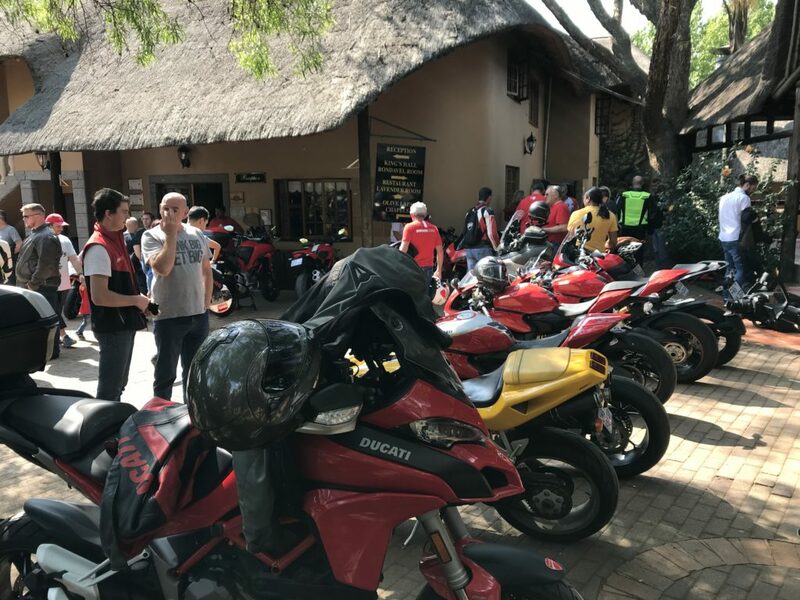 People in lycra looked on as people in leather – with understandably chirpier countenances – walked past to the lapa for a full english breakfast, more mockery and more merriment. 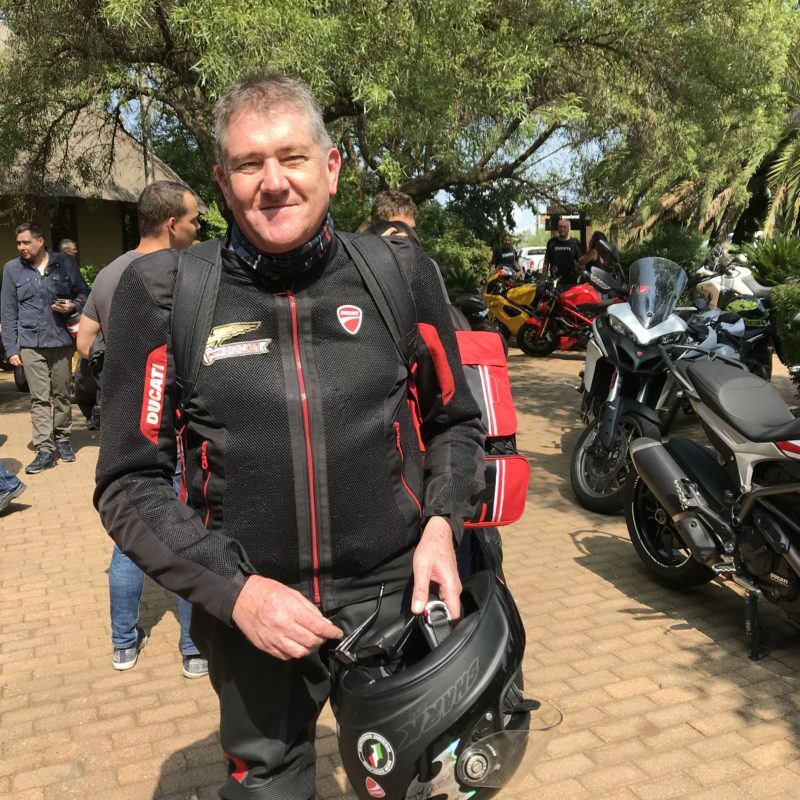 Also on the agenda was the DOCSA annual general meeting, where people were keen to see what was on the cards for 2018 since the new crowd, led by newly-appointed Jonathan Isherwood, took over. 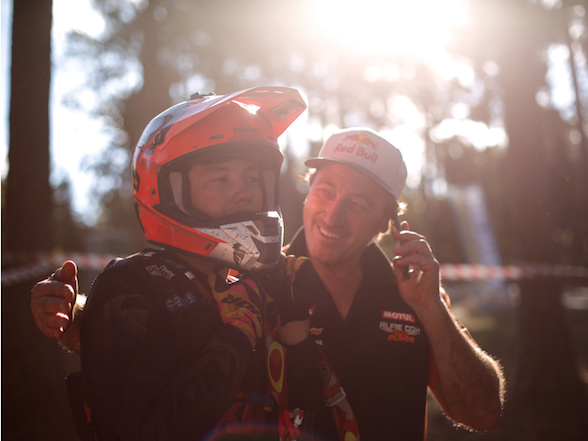 In the end, everyone seemed pleased with the new direction, with various people signing up. 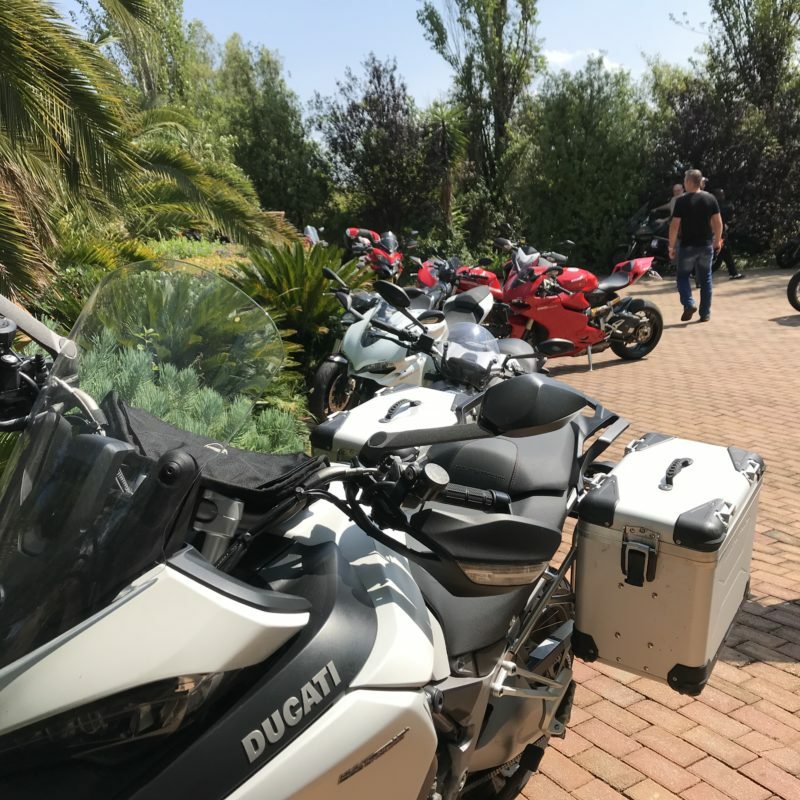 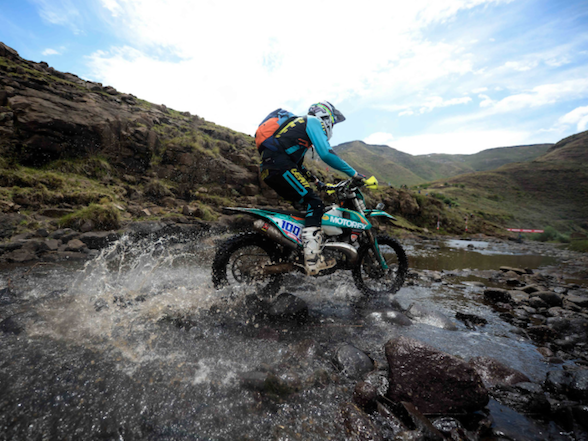 We took the Ducati Multistrada Enduro on the run, and arrived characteristically late meaning we had to try and catch up. 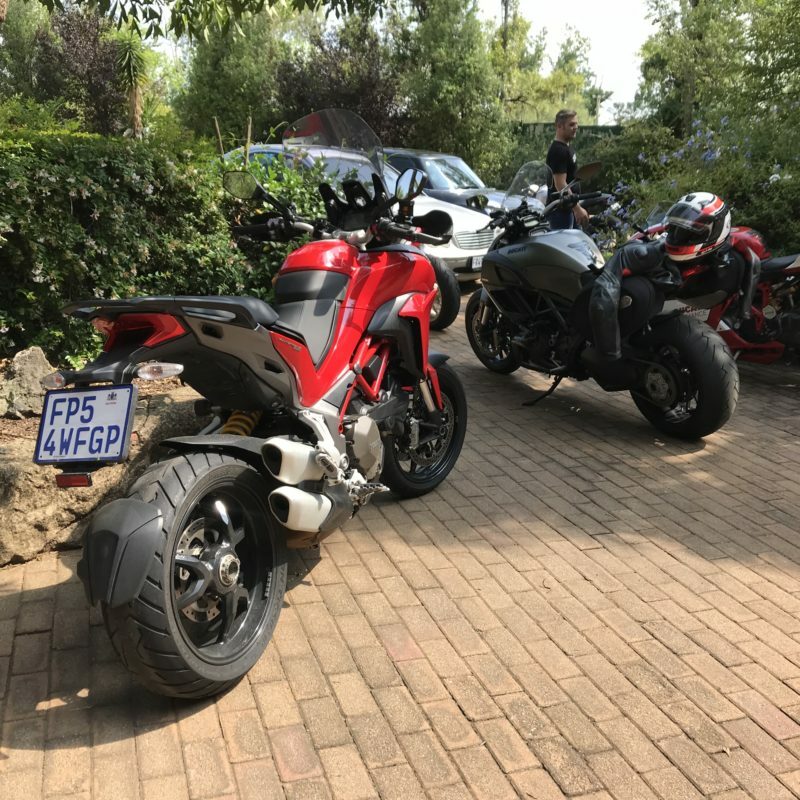 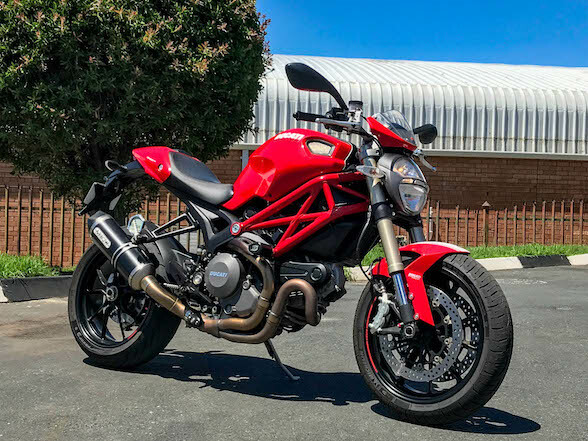 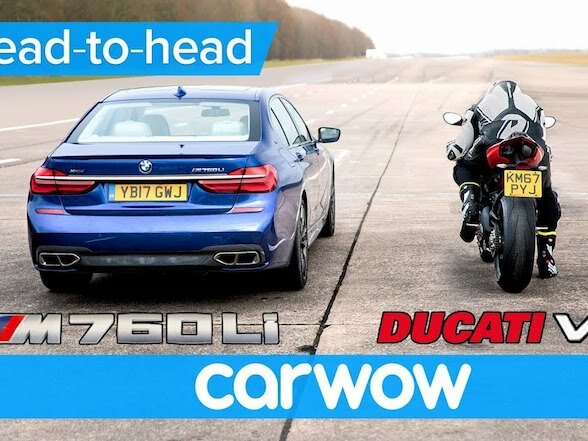 The Enduro, with its off-road prowess, is understandably taller than its Ducati brethren, and that makes it tricky to manoeuvre when you are 4 foot 3 like me, but when you are chasing a line of Ducatis through Randburg, the extra height above cars has its benefits. 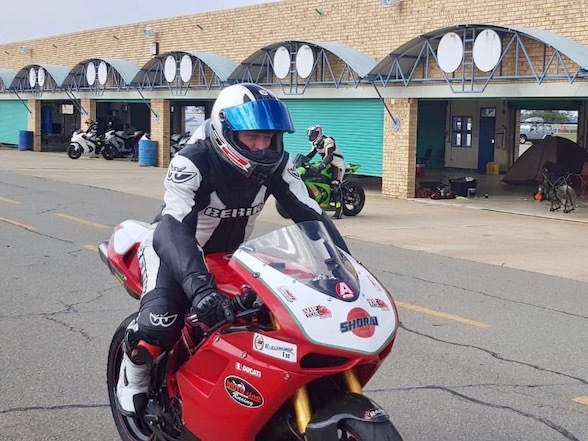 The motor is 160hp and therefore shooting up to speed is a doddle while my passenger – who, thankfully, races bikes also and is quite happy with speed – holds on gleefully. 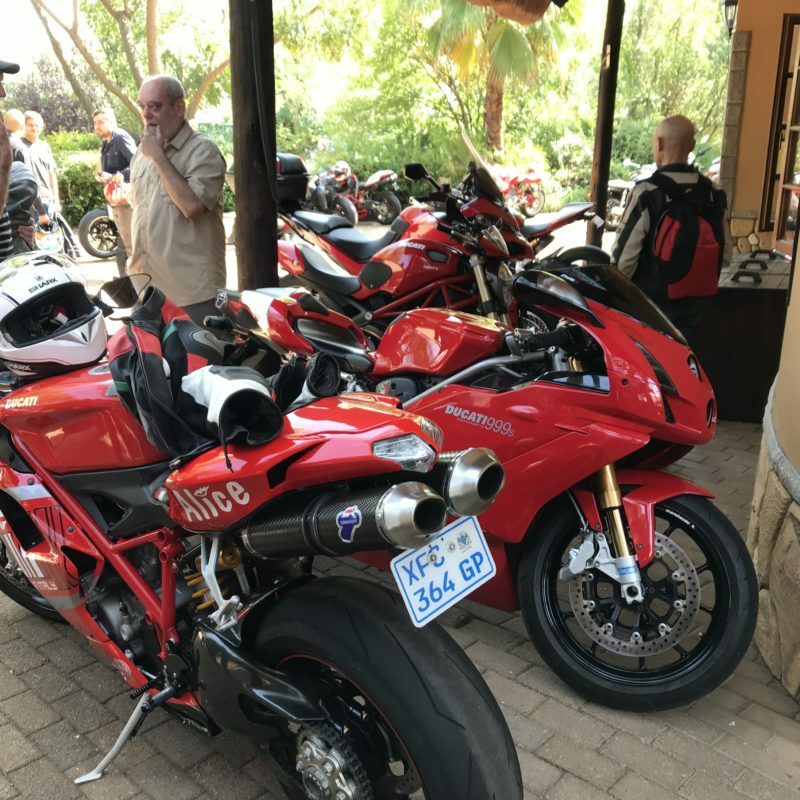 Obviously the pillion seat hosts some comforts, because when we did catch up to the group and continued at a more sedated pace, there was an incidence when I’m quite certain she fell asleep. 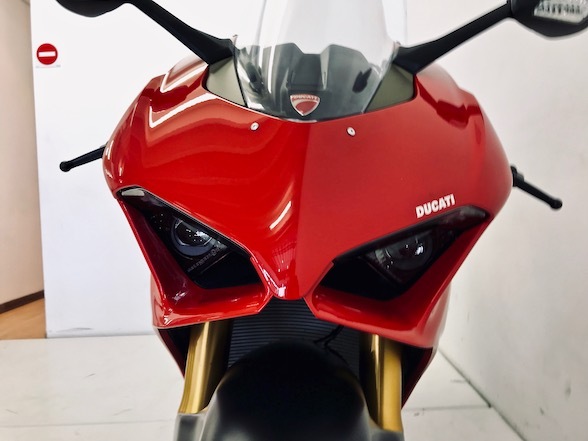 That probably wouldn’t happen on the back of, say, a Panigale. 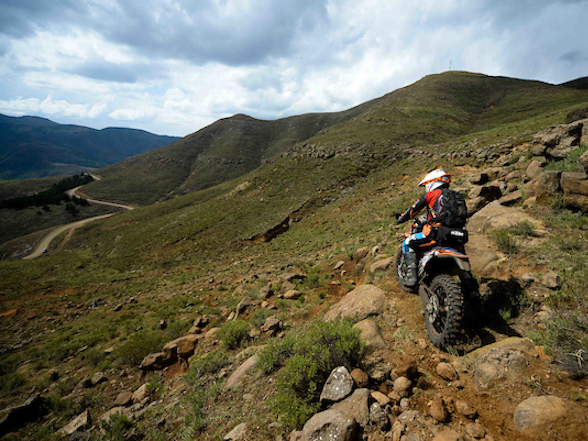 Of course, one squirt of the throttle and all sleepiness disappears. 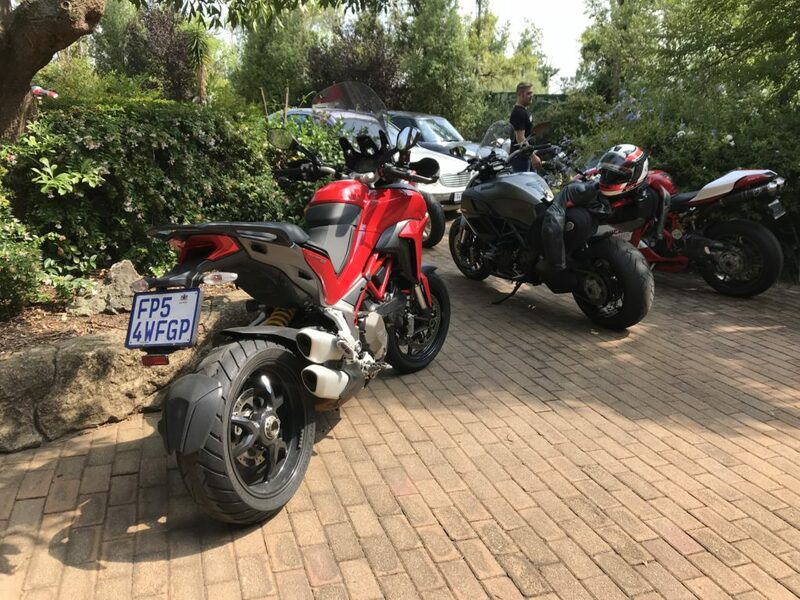 We didn’t do any off-road, but the road riding was sublime, helped by the fact that this specific bike did not have knobblies. 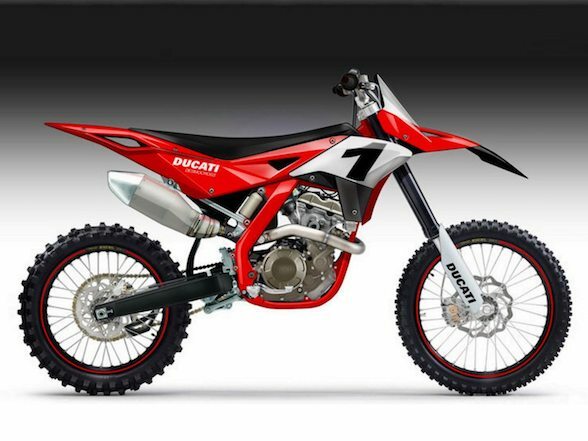 If you want to see a full road test of this motorcycle on dirt, see the story we did with motocross racer Grant Frerichs.